The Stolen Generation is a term used to describe those children of Australian Aboriginal and Torres Strait Islander descent who were removed from their families by the Australian government under Parliamentary Act in 1869. The forcible removals occurred from 1869 to 1970 that given the catastrophic population decline of Aboriginal people and disintegration of their cultural roots leading to numerous psycho-social problems. The children were removed forcefully and against the will of their parents. Over 100,000 children were brutally and forcibly removed and in some cases the infants were removed soon after their birth. There are no genuine statistics about the stolen generations today. Many records have been lost or destroyed. Most of the parents whose children were taken never saw them again. One in ten Aboriginal children were separated from their mothers during these years. Such removals were made by the Police Officers or Aboriginal Protection Offices who were white Australians. The children were held in Government institutions and subjected to inhuman conditions. The aboriginal children were prevented using their native languages and rituals. Often they were severely punished for using their indigenous languages. They were prevented being socialized. The siblings were deliberately separated from each other. The children were taught to reject their Aboriginality and to regard Indigenous culture as evil. The aboriginal boys were trained to become agricultural labourers and the girls as domestic servants to serve in the White Australian households. According to the comments made by some Historians and Sociologists the Stolen Generation represent a cultural genocide. They argue that the Australian Government literally kidnapped these children from their parents as a government policy which was managed by the APB or Aborigines Protection Board. The ABP gave the power to remove children without parental consent and without a Court order. Therefore it was an institutionalized atrocity against the Aboriginal people which based on racial grounds. This policy made tens of thousand of Aboriginal families to suffer and breaking up of important cultural, spiritual and family ties. It affected individuals as well as the community hence creating a collective trauma. Sir Ronald Wilson the President of Australia’s Human Rights Commission once called it as an attempted genocide. 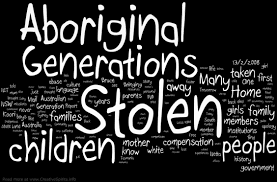 As the Psychiatrist Dr. Jane McKendrick of Melbourne University points out high proportion of people from the Stolen Generations were psychologically, physically or sexually abused while in care. Many victims suffer from anxiety, depression and post-trumatic stress. The repercussions of the stolen generations still echoes the Aboriginal community. They have high prevalence of alcoholism, suicides, domestic violence and child abuse. The average Aborigine life expectancy is 17 years shorter than the rest of the countries’ population. The victims still have Inter-generational effects with poor parenting skills, behavioural problems, unresolved grief and trauma due to the institutionalization upbringing. People who experienced forcible removal in childhood experience blunt emotions, insecurity and they have lack of trust in the outside world. They even pass down negativity to their offspring. The stolen generation lacked socialization which includes processes of being nurtured. They often found difficulty in sustaining and developing good constructive family relationships with their own children. Therefore the collective trauma became a vicious cycle. Traumatic removal of Aboriginal children from their parents at young age with no substitute attachment figures resulted a social calamity. The common psychological impacts have often manifested in isolation, drug or alcohol abuse, criminal involvement, self harm and suicide. Trauma experienced in childhood embedded in the personality and physical development of the victims. It destroyed Aboriginal identity and knowledge of Aboriginal culture. The mental anguish they suffer is directly linked to being taken from their parents. Indigenous Australians suffer disproportionately high rates of psychological ailments. The Aborigines of Australia were the first people to set foot on the continent, somewhere between 40,000 and 60,000 years ago. Europeans settled in Australia in 1788. The colonists battled natives for their land. A hundred years later Aborigines no longer held much of the continent and many Aboriginal groups were struggling for survival. There may have been between a half million to a full million Aborigines at the time of European settlement; today about 350,000 live in Australia. Following the European interventions Aborigines lost their spiritual homes as well as their source of food. Hunger, disease and armed attacks killed thousands of Aborigines. They lost their lands, cultural links and eventually their children. The APB policy affected not only the aboriginal victims even the enforcers for some extent. According to an article written by Lang Dean in 1997 describes the anguish of his father a Victorian policeman from 1922 until 1946 who made over 343 removals. As the author describes after such removals the policemen was crying and sobbing as a child. He removed aboriginal children against his conscience and repented until his last days. On February 13, 2008 Australian Prime Minister Kevin Rudd asked for an apology from the victims of the stolen generation even though the former Premier John Howard rejected calls for a formal government apology. Some political analysts criticized John Howard who had been a Member of Parliament in the 1960s – when forced removal was still a government policy. Although many Indigenous Australians welcomed the official government apology they highlight that it does not pay any compensation for the suffering that they underwent. As a result of the government made disaster they are still experiencing the anguish. The apology was sweet but it was merely nothing but words which will not resolve their current problems. Yes, true. At the same time we must also remember how much Aussies appreciate work carried out by their Defence services. Though they lost the mission at Gallipoli they remember those who gave their lives for this. On April 26 even Sri Lankan exservex-servicemen join the parades around Australia. But look at Sri Are we treating our heroes in the same manner?? ?